To experience the essence of Italy and the height of Italian-ness, head south to the region of Campania, which embraces within its borders some of the most iconic Italian hotspots—Naples, Capri, and the Amalfi Coast. 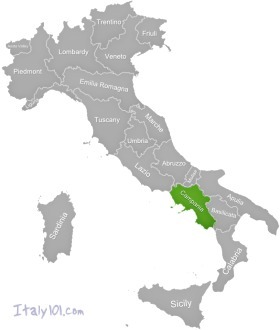 Bordered by the regions of Lazio, Molise, Basilicata, and Apulia, Campania is Italy’s second most populous region and a perennial favorite among Italian and international tourists alike. With all there is to do, see, and taste, this region could easily devour the entirety of your Italian holiday. If time permits, allow at least four or five days to tour and soak in this very traditional Italian setting. Hardly for the faint of heart or the traveler seeking idyllic country settings for relaxation, Naples, the region’s capital city, is Italy’s bustling urban wild child—and completely worth a visit. Known as the birthplace of pizza, and famous for its secret ingredient coffee, Naples is a fiesta for the senses. Stroll the crowded streets tasting pizzas and observing the piazzas, cathedrals, and monuments that decorate the city. For history and art lovers, a trip to the Archeological Museum is a must. 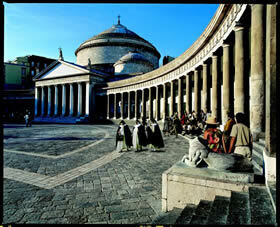 It will also give you a good sneak preview and some useful background information before your visit to Pompeii. Pompeii, the town destroyed by Mount Vesuvius in 79 AD, is a UNESCO World Heritage Site. It also makes a great way to spend half a day. Tour the ruins and get a feel for ancient Italian life. To visit Mt. Vesuvius (still considered an active volcano) take the local bus. A hike to the top will take roughly a half hour. Continue a bit further south and you’ll come to Sorrento—Naples’ antithesis. Where Naples is loud, busy, and urban, Sorrento is calm, clean, and comfortable. If you love craggy, coastal views, traditional Italian charm, and loads of lemons, Sorrento is the place to park your suitcase for the week. Sorrento also serves as an ideal ‘home base’ for your travels throughout Campania—most of which can be enjoyed and completed within a day. Lodge in Sorrento and then visit nearby cities and attractions via bus, train, or rented car. From Naples you might make a trip of a day or two to the nearby Island of Capri. Though less attractive during high tourist season (July-August), Capri is a fun side trip during calmer times of year. Explore the famed Blue Grotto and then take the chairlift up the Monte Solaro to enjoy the vistas and lush scenery. Wear sturdy shoes so you can hike down the mountain after your ride. Campania stretches out along the Tyrrhenian Sea, creating the area known as the Amalfi Coast. This area, infamous for its treacherous drives along the craggy coastline and its breathtaking natural scenery, is an Italian gem and a traveler’s paradise. To explore the towns along the coast, rent a car, or go by bus or taxi. From Sorrento you can head south and then east to hit the towns of Positano, Amalfi, and Salerno. Ravello is just northeast of Amalfi and the musical capital of the area. It’s also the location of the annual Ravello music festival. The birthplace of pizza, calzoni, and a wide range of foods that can be eaten standing up, Campania is known as a “sanctuary of street food.” Pizzas, breads, and other classic snacks are available on every corner—perfect for the traveler who doesn’t want to break the sightseeing momentum for a sit-down meal. But pizza shouldn’t be your sole sustenance when traveling Campania. The rich, volcanic soils throughout the region result in varied and delectable produce from the omnipresent lemons to lentils to farm-produced products such as the beloved Mozzarella di Bufala — the authentic fresh mozzarella made from buffalo’s milk. Other fine regional cheeses include Pecorino, Caprignetti alla erbe (a goat’s milk cheese covered in herbs), Provolone, and Caciocavallo. While other regions, especially those in the north, incorporate unique grains into their staple dishes, such as polenta, risotto, and other rices, Campania specializes in traditional Italian pasta, namely spaghetti. San Marzano tomatoes form the base of their delicious sauces. And don't forget to save room for dessert. Campania produces some of Italy’s finest gelatos and granitas, as well as pastries such as the sfogliatelle, a flaky pastry with ricotta cheese, struffoli, and zeppole. End your meal with the sweet espresso that’s characteristic of the region and a sip of limoncello—the famous Italian liqueur produced from Campanian lemons. When pairing a regional wine with your meal, select the white Greco di Tufo or Fiano di Avellino. If the meal calls for a choice red, Taurasi is your perfect pick. To start your tour of Campania, arrive at the Naples International Airport or come by regional train. Naples, Sorrento, and other main towns along the coast can be accessed by the Circumvesuviana rail line. Explore or reach smaller coastal towns and villages by bus or taxi. 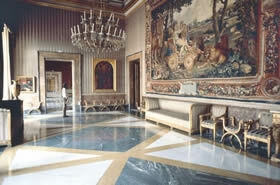 Campania, Naples - the Teatrino di Corte (court theatre) in the Royal Palace is now a venue for prestigious meetings. 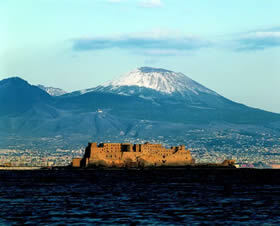 Castel dell'Ovo, a Norman masterwork, with an unusually snow-capped Vesuvius in the background. 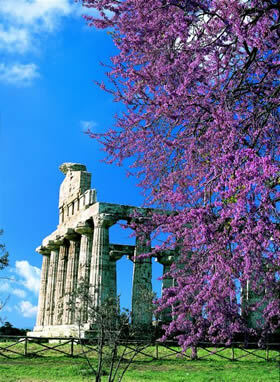 Paestum - flowers in bloom in homage to Ceres, the goddess to whom the Temple is dedicated. 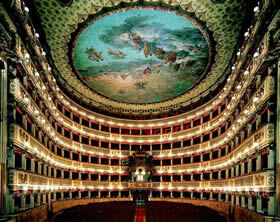 Teatro San Carlo, a shrine to opera renowned throughout the world.